While the choice is completely individual, I am all about moving forward this year! I am going to be very directed with my WIPs and UFOs and I feel like the following criteria will reflect that spirit! 1. It’s been on the shelf for a year… or more! Popular organizational wisdom tells us that “if you haven’t seen it in over 2 years, it is safe to get rid of it.” I’m going to do them one better and say that if you haven’t worked on it in a year, it’s time to rip it back. Exception: If for some reason seeing the project again ignites the crochet fever in you, then by all means finish it. Otherwise, rip it back! 2. You don’t like it anymore. It’s happened to me before, and I think it may have happened to the best of us. You start a project with the best of intentions and then along the way you realize that this thing just isn’t what you had thought. No worries and no hard feelings, honey. Rip it back and get your yarn back! 3. It’s a gift you never finished. This could be a really guilty one, but guilt dissipates when we do something about it. That bit, bauble, or blankie you started for the baby who is now 16 needs to be ripped back. Just get over it and buy the kid a gift certificate for the movies or something! 😉 But seriously, if you do have an unfinished gift, now is the time to admit it, rip it back, and get your yarn back. Scratch that person off your gift list by buying them something and enjoying the feeling of freedom! 4. You’ve tried, tried again. This tip comes from Crochet Spotter Collette Griffith, “If I have a project that is giving me fits, I’ll stop on it, go to something else for a while, then go back to it. If that doesn’t help, I’ll repeat the whole process. But, if it STILL doesn’t work for me, I’ll frog it, and use the yarn elsewhere!” I agree wholeheartedly, Collette! Get your yarn back! 5. The yarn is yucky. It can be humbling to admit you’ve made a mistake in yarn choice. Maybe there’s absolutely nothing wrong with the pattern but you can’t bear the thought of slippers in that scratchy wool or a drapey shawl in that rough acrylic. Well, guess what! You don’t have to! Rip it back, get your yarn back, and if you still hate it, just give that yarn away. Life is too short for unsatisfying hobbies! Make room in your space and in your life for better, more beautiful yarn. There is someone out there who would find the perfect project for your cast offs! So what about you, my friends? How do you decide when to rip back a project gone wrong? Please leave your thoughts, ideas and questions in the comment section below. I would love to hear about your finished and ripped projects! This entry was posted on Wednesday, February 4th, 2015 at 12:00 AM by Caissa "Cami" McClinton	and is filed under Fun Ramblings. You can follow any responses to this entry through the RSS 2.0 feed. You can skip to the end and leave a response. Pinging is currently not allowed. 2013 Winter Holiday Crochet Update Time! I have frogged several projects that my mom started. I have no pattern, not a clue where to get a pattern or even what she was thinking. So I frogged some projects to claim back the yarn. At first it felt awful, then I thought, I bet she frogged things or maybe she didnt and that is why there are all these unfinished projects. You just have to frog sometimes. I hear you. I can completely understand that it might feel weird to rip back projects you’ve inherited but your reasons sound very logical and I’m glad you’re moving forward. Maybe you can make something really special with the yarn you’ve recovered! Where did the term “frog it” come from? What is UFO and WIP? Just curious where these terms are coming from. You Frog It because you rip-it, rip-it, rip-it (ribbit, ribbit, ribbit). UFO is UnFinished Object and WIP is Work In Progress. A few years ago I decided I had to finish all 10 of my UFO and WIP before I could buy any yarn. I finished 5 very quickly, then another 2 in relative time. Was feeling good until #8 ….. I reasoned that if I frogged it then it was like I never started so I didn’t have to finish it. It felt great, I have been delightfully frogging ever since. I also learned I don’t have to finish reading every book I start. It was a year of releasing! I have no problem frogging – it is the process of crocheting that I enjoy – and while the product is secondary, it has to become something I will enjoy wearing, drapes and fits properly, or will make me feel good about gifting. Otherwise – Frog and alter pattern to meet my criteria. Sometimes I just need a specific yarn and know where I can reclaim it. I crochet every day and if I run out of yarn before I run out of time, I pull the project apart and start over. Finally, I have a piece I have reworked into three different scarves. I am frogging it for, I hope, its final incarnation – the edging to my road trip scarf. This method will certainly keep you crocheting! Good luck on this final iteration! I crochet for pleasure and relaxation. If the project is becoming tedious and stressful…out it comes! Frogging is not a waste if you just use the yarn for a better project. This comment warmed my heart. Thank you! Enjoy ripping it back and maybe making another one (if you still like the pattern) in better yarn! Yah! Give it a go and let us know how it progresses. 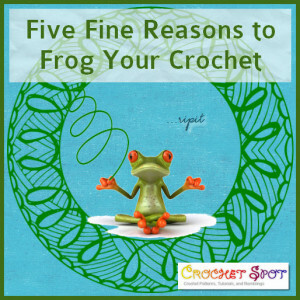 I had never heard the term “frogging” while crocheting, but I admit I am a frogged when I have lost interest or forgot over time what my intention was with the year. It’s a special feeling when you can recycle! Yeah, it’s really cute that we have these terms now and it does feel great to recycle! Thanks for this article. Great tips. I have done the gift for baby thing that I didn’t finish in time but instead of frogging, I finished it and donated to a hospital for their clinic. Lots of moms don’t have enough & they just love the donated items! Debb, thanks for your comment. Great idea about donating your crochet to the hospital! I belong to a wonderful group called From the Heart. Basically you can make anything you want, donate it to their “stash” aNd when a group needs things they contact FTH and we fill their request. I believe the group has donated over 200,000 items since they started 12 years ago. All sorts of groups; veterans hospital, NICU, cancer centers, schools, homeless shelters. Every once in a while we get a call out. Recently hats were needed but people made them so fast they had to rescind it and say now we need scarves to go with them. Fun group of people and so dedicated. Howdy, Reading about frogging, I got to wondering how do you rewind the yarn to keep it from stretching any further, and to get the kinks out from being in stitches for awhile? Thanks for help. I just wind by hand, loosely. I don’t think I’ve ever done something that has been stitched a really long time, so not sure if it would work as well. I just put the bare minimum tension on the yarn as I wrap it around my hand. Be careful as the ball gets bigger; it’s very easy to begin pulling it and stretching then. Is there any way to frog the beginning of a project without destroying the end. I knew it wasn’t quite right, but just not how bad, so I kept going. The end turned out okay, but the first half is a mess. Is there any way to rip out the bad part and do it over? Kind of working backward from the middle? Thanks, Bonnie. That’s pretty much what I thought. Just hoped someone else had come up with a miraculous cure. I was making it for a gift, but I guess I will keep it for myself and make something better for the gift. I had a project I had started a long time ago. The stitches were small (Knitting project) and because it required small needles. When I finished it, it was an odd shape because I had picked up what I thought were dropped stitches, so the end of it was much wider than the beginning. I tried to take it apart so I could reuse the yarn. I ended up picking out each stitch. I gave up on that and have it laying around. No-one would want it. You have just given me permission to throw it away as well as permission to not finish a project I’ve lost interest in. I make prayer shawls and lost almost a year of projects because I thought I had to finish this old one. Thank you.